Reprint. Originally published: Sydney, N.S.W. : Pan Macmillan, 2014. 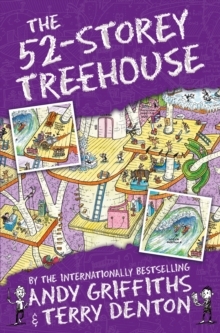 Winner of the ABIA Book of the Year AwardAndy and Terry's incredible, ever-expanding treehouse has thirteen new storeys, including a watermelon-smashing level, a wave machine, a life-size snakes and ladders game (with real ladders and real snakes! ), a rocket-powered carrot launcher, a Ninja Snail Training Academy and a high-tech detective agency with all the latest high-tech detective technology. Which is lucky, because they have a BIG mystery to solve - Where is Mr Big Nose?? ?Well, what are you waiting for? Come on up!The 52-Storey Treehouse is the fourth book in Andy Griffiths and Terry Denton's wacky treehouse adventures, where the laugh-out-loud story is told through a combination of text and fantastic cartoon-style illustrations.